Previously, I posted some photos about the March 10, 2016 windstorm. An unusually high tide plus a storm surge had some dramatic effects on my neighbors' front lawns. The weather has improved significantly this week. 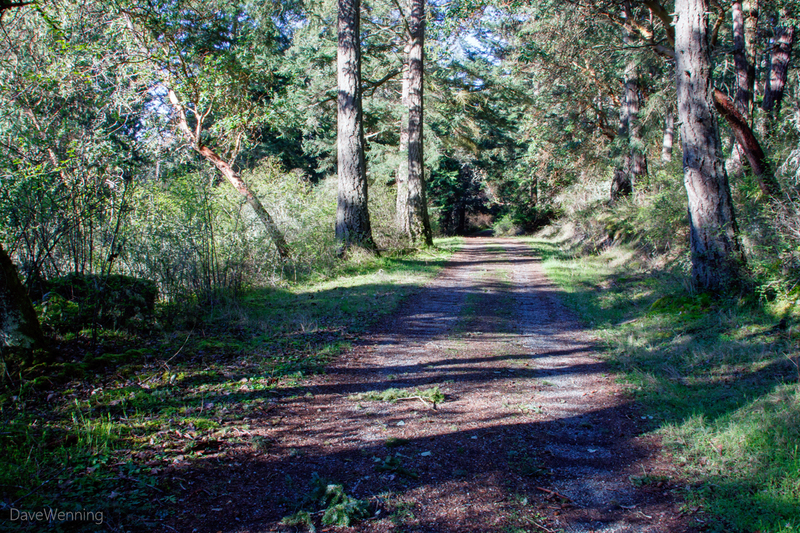 With a nice day, I headed over to the Kukutali Preserve for a hike. Kiket Island (in the background of the photo) is connected to the mainland by a double tombolo. A pocket estuary or lagoon (right edge of the photo) is sheltered between them. A road over the main tombolo serves as a causeway to the island which was once privately owned. The road is now open only to foot traffic and park maintenance vehicles. I discovered that storm and tidal surge had some amazing effects here as well. There is a private home next to the preserve, A chain link fence separated a lawn from the road and marked the park boundary. Where there was once lawn to the left of the road is now an enlarged driftwood field. A line of debris across the road reveals where the tidal surge washed over it. Much of the chain link fence has been knocked over. The driftwood field that existed on the far end of the causeway has been expanded five- or six-fold now. 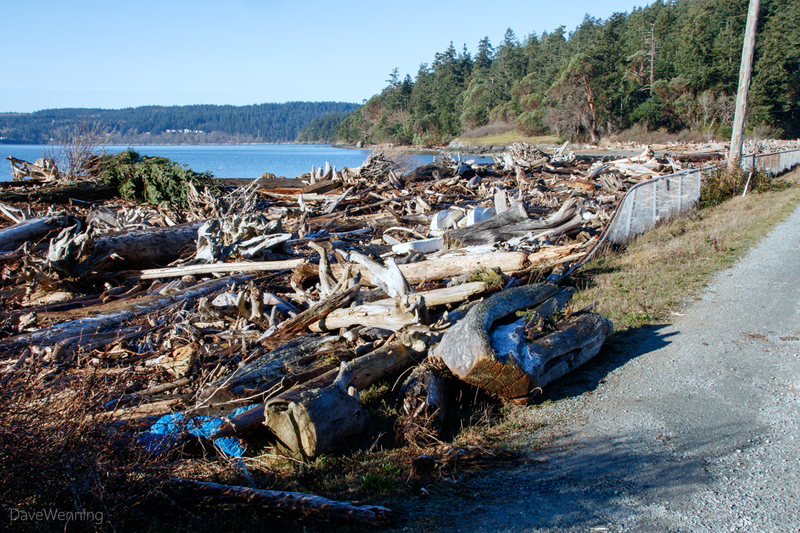 Besides driftwood, the debris includes various flotsam including a small catamaran. 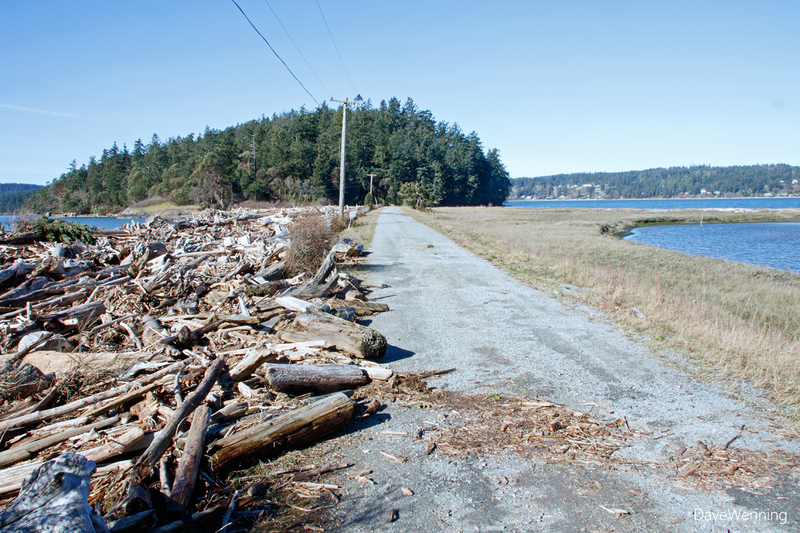 Looking back up the road, the western end of the tidal over-wash is indicated by another debris line. The other edge of it is where you see driftwood extending into the road in the distance. You can click or right-click the photos to view them full size. 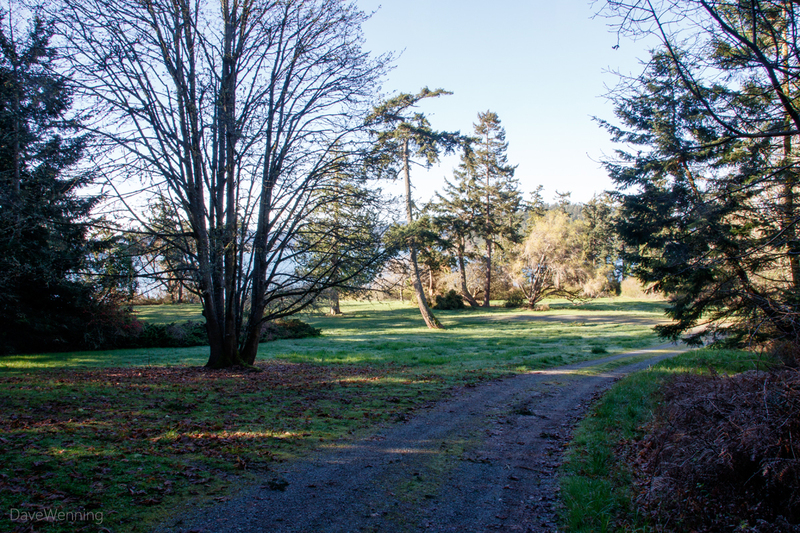 The hike across Kiket Island to the lawns at the site of the former Dunlap house is one of the most pleasant in the area. 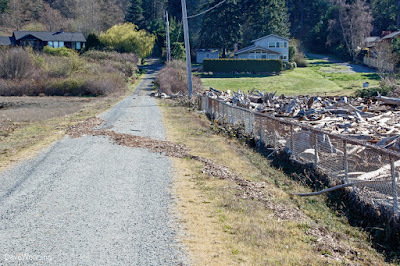 Along the road, I saw little evidence that a windstorm had ever occurred here. 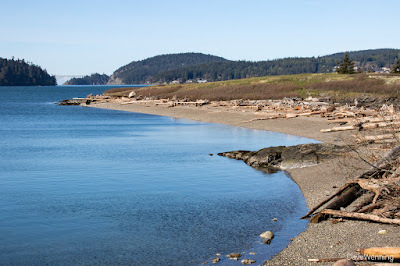 There is a corridor of shrubs and trees that leads from the Dunlap lawns to another sandbar tombolo connecting Kiket to Flagstaff Island. What a shock it was to emerge and discover the sandbar is now completely covered with driftwood. The grassy strip and path have disappeared under it. The only approach to Flagstaff Island now is via the north beach. 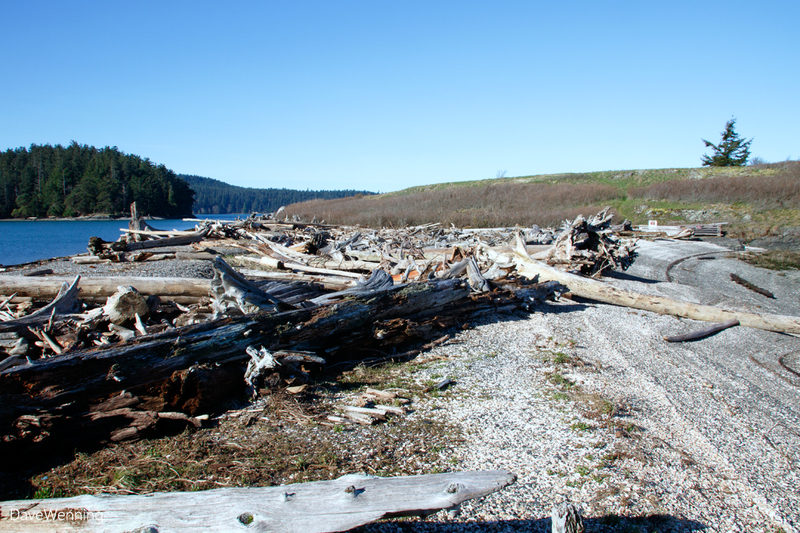 Scrambling over the expanded driftwood field to the south beach has become a difficult undertaking. In July, 2011, the tombolo was a grassy wildflower meadow traversed by a path. I included this photo in a post about tombolo wildflowers. There are additional photos of it in this 2009 post from the Gravel Beach blog. The bottom two show the Flagstaff tombolo as it once was. I took this photo in December, 2014 for a post about tombolo erosion. 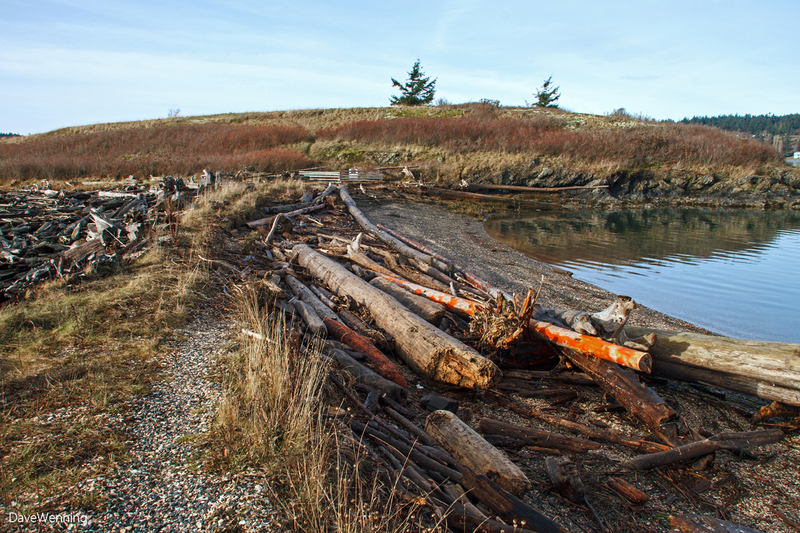 A lot of the north side of it had washed away, but it was still intact and open between Kiket and Flagstaff Islands. On the left edge of both photos, you can see a bit of the driftwood field that filled a depression at the southwest corner of the sandbar. What an amazing site this is now. 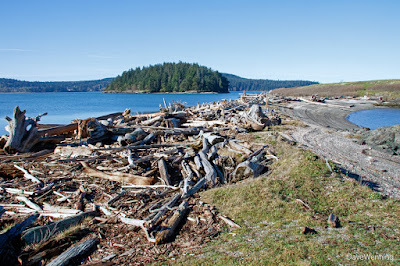 A major driftwood accumulation covers the entire sandbar to the edge of the north beach. 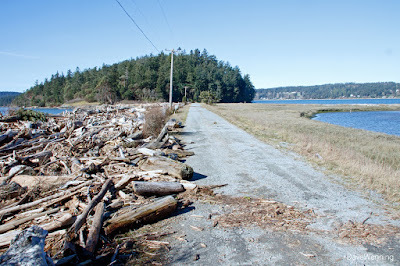 A single windstorm with an unusually high tide caused all this change. The south (left) edge of the tombolo received the brunt of the storm. The north side was sheltered and remains relatively pristine. 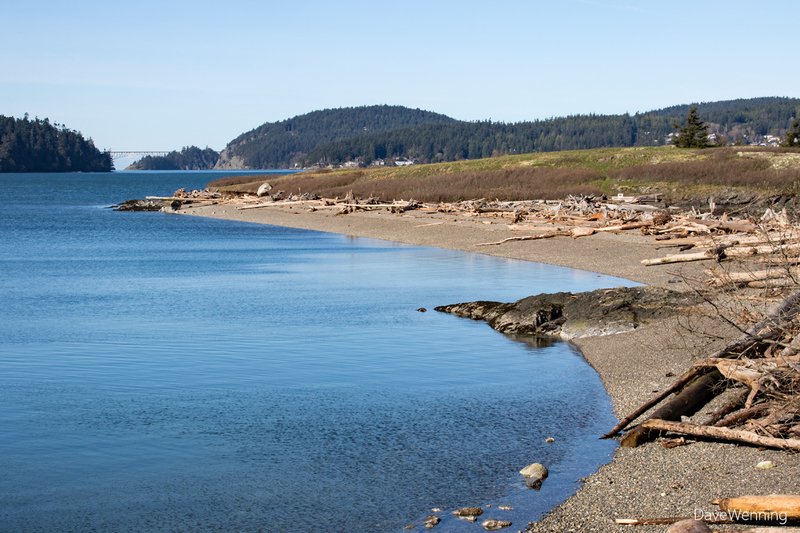 The small island beyond the driftwood is Skagit Island Marine State Park. 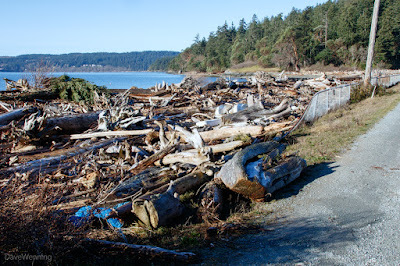 All of the driftwood that previously lined the south beach has been tossed up and over the tombolo. My weather stationed clocked a peak wind of 42 miles per hour (68 kph) during the storm. This low lying sandbar is more open and exposed than I am. It would not surprise me if the winds here exceeded 60 mph/97 kph. Driftwood accumulations like this serve to protect adjacent land from wave and tidal action. 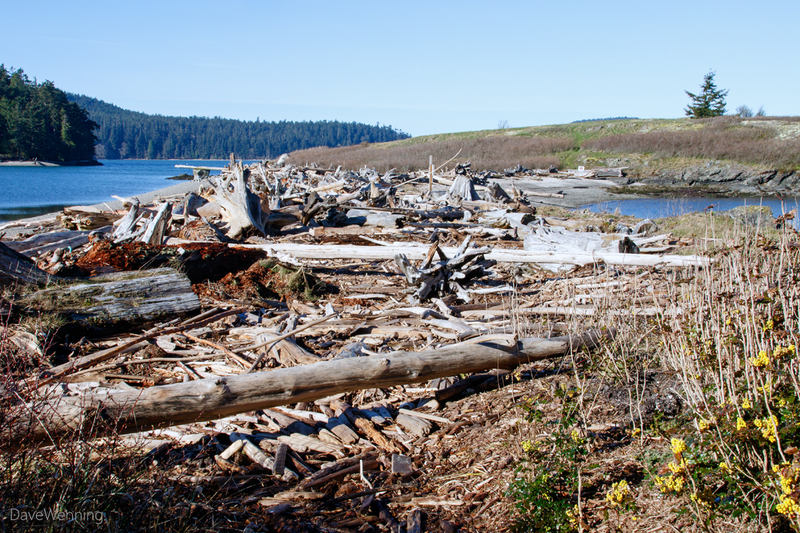 Waterfront homeowners are advised to leave such accumulations intact, letting them develop naturally. My neighbors keep trying to rearrange the driftwood to their liking only to have nature thwart their efforts. It will be interesting to see how these land forms in the Kukutali Preserve continue to evolve. This view of Deception Pass from Kiket Island offers little evidence of the tempest that must have raged here just a week before. This system of islands and sandbars has existed here for centuries, perhaps millennia. I have been here for only a tiny fraction of that time. Based on the major changes I have witnessed in just the last five years, only a fool would not wonder if something is going on with the climate. Really interesting to see the changes from your past wanderings! Yes, definitely climate changes afoot.